Founded in 1943, GN ReSound is a Danish manufacturer of hearing aids committed to helping people rediscover hearing. For the past few decades, ReSound has been a leader in shaping the technological advancements of hearing devices, especially with their Wide Dynamic Range Compression sound processing system and their Digital Feedback Suppression, the first of its kind to eliminate the whistling and buzzing of hearing aid feedback. With offices in 25 countries and distributors in 80 countries, ReSound uses research from hearing aid wearers around the world as they create new technology. The LiNX 3D and ENZO2 both offer nature sound therapy to alleviate the symptoms of tinnitus. The ENZO2 is available as a behind-the-ear style, while the LiNX 3D is available as behind-the-hear, in-the-ear, receiver-in-canal, invisible-in-canal, and completely-in-canal hearing aids. Both LiNX 3D and ENZO2 hearing aids are customizable for the best fit and to meet wearers’ aesthetic preferences. With its small, discreet size and long-lasting battery, you get power that lasts more than a full day – without having to fiddle with any batteries. If you do forget to charge, the portable case’s built in battery holds three full charges of power, giving you the freedom to charge anywhere. 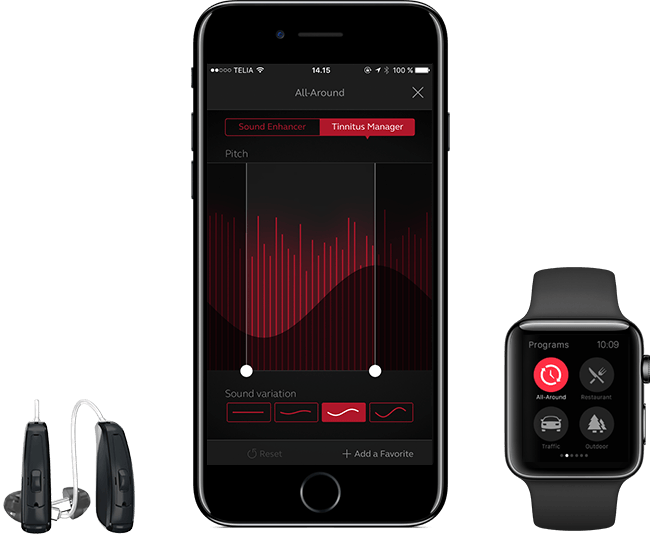 Developed as a Made for iPhone hearing aid, the LiNX 3D allows wearers to connect wirelessly to their iPhones and other personal electronic devices. Wearers are able to stream phone calls and FaceTime conversations directly to their hearing aids, as well as music, TV, movies, and other media. In terms of accessibility and personalization, the LiNX 3D offers a geo-tagging function which stores wearer preferences in specific locations and automatically adjusts to those settings when the wearer returns. This seamless listening experience allows wearers to focus on the world around them, rather than the volume of their hearing aids. The LiNX 3D has a streamlined and discreet design, covered in iSolate nanotech coating, which protects the hearing aid from water, dust, sweat, and debris. ReSound’s ENZO2 is a unique device in the hearing aid market: it is one of the few devices designed to specifically treat severe to profound hearing loss. With higher degrees of hearing loss, speech recognition and spatial awareness become increasingly difficult, especially in challenging noise situations, such as busy restaurants or in cross conversation with multiple people. Similar to the LiNX 3D, theENZO2 offers New Binaural Directionality II, Spatial Sense, and Surround Sound, and wireless connection to personal electronic devices. ReSound’s ENZO2 is a unique device in the hearing aid market: it is one of the few devices designed to specifically treat severe to profound hearing loss. With higher degrees of hearing loss, speech recognition and spatial awareness become increasingly difficult, especially in challenging noise situations, such as busy restaurants or in cross conversation with multiple people. Similar to the LiNX 3D, the ENZO2 offers New Binaural Directionality II, Spatial Sense, and Surround Sound, and wireless connection to personal electronic devices. Interested in GN ReSound hearing aids?